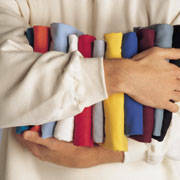 Custom T-Shirts with LOW MINIMUM ORDERS! Need custom t-shirts printed? Circle R Printing offers quality screen printing and embroidery services for individuals, companies, schools, family reunions, or for any other occasion. We will help you take your idea and make it a t-shirt reality. We can print baseball caps, visors, sweatshirts, polo shirts and more with a fast turn around and a price that will fit any budget! We are your affordable, high quality printing solution. We print on only first quality products from the top name brands. and many more. We have a garment to fit every budget and need. Whether you need promotional giveaways or if you're starting your own fashion line, our in house art department and printing specialists will give your job the specialized attention it deserves. Call us toll free today at 1-888-842-4725 for a QuickQuote on your next printing project and we'll work with you to answer any questions you may have about the process. Visa, MasterCard, Discover, American Express and PayPal gladly accepted.